This movie shows how to add a folder on your remote server to DV Kitchen, as well as showing some tips and shortcuts along the way. 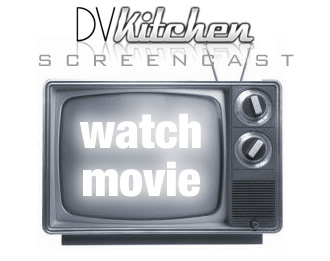 I would really like to see a few more step by step tutorials on DV Kitchen particularly on publishing the movie files to a web site. The manual is not comprehensive enough for those of us who need a little more “step by step” instruction. Thank you very much and I think this is a great program for the price – You can’t beat it !! We are definitely working on more movies. But, the manual does have step-by-step instructions on publishing under the Media Publishing section. It steps through publishing Quicktime and Flash movies and the various options with each.